People ask me all the time how I went from working at the glossy pages of Vogue to founding , an organization implementing sustainable community development in rural Kenya. The two may seem worlds apart. But it only takes twelve steps to get from 4 Times Square to the African bush. 1. Start a long distance relationship. Then get on a plane. Before my first trip in 2005, I read the international news about Kenya's dark side. I also read the romantic and iconic stories of , , , , , and . I talked to everyone I could about the country: the jetset, the gypset, the journalists, the expats, the artists, the locals, the royalty, and the politicians. I wanted to get the real story for myself. I read the paper (), downloaded music (), tried local cuisine and cocktails (, Tusker beer). And still, I was consumed with the unknown. I wanted adventure and beauty. Kenya has both. I wanted to show Kenya how serious I was about learning all about her. 2. Tell your story to anyone who'll listen. Keep a journal. Write a blog. Take your Flip. Snap those pictures. The best thing you can do for Kenya is tell the stories you'll never find in the press. Stories about anonymous mavericks, colorful communities, ingenious inventions, sustainable development, and the country's massive potential. When you travel to a place like this, you have an enormous responsibility to report back. Sharing stories with friends and family becomes a means for inspiring change in thinking and perception. 3. Choose a motto to live by. was a creative activist who lived and loved Kenya. For those who are unfamiliar with the legacy of the late young Reuters journalist tragically killed in Somalia in 1993, remember his key phrases: safari is a way of life, select your team with care, and the journey is the destination. These little sayings remind me to slow down, travel carefully, enjoy the moment, love the people I surround myself with, and approach life with creativity. With those ideas in mind, we can all become creative activists. 4. Select your team with care. I've traveled to Kenya with strangers, with friends, with locals, with warriors, with journalists, with doctors, and all alone. Which has allowed me to fully experience luxury, poverty, solitude, insanity, horror, beauty, honesty, and adventure. The kinds of people you travel with dictates your experience and memory. In my opinion, travel is the most intimate journey you can go on. Figure out the best travelers for your purpose. 5. Be the ultimate tourist. Everyone can go to Kenya on a luxury safari. Everyone can be a tourist in this magical place. Kenya's economy is built around tourism so the best thing you can actually do for Kenya is spend your money in Kenya. Yes, see the (my home away from home: ). Go to the pristine coast and experience a different world on Lamu at the famous . Stay at the uniquely gorgeous camp . Go on an isolated walking camel safari in the middle of nowhere with the Samburu and . Say yes to the spectacular tree houses of Nairobi's . Have a fabulous Italian dinner at followed by cocktails and hookah at . 6. Become a local (even if it's for just a little while). The scenery and wildlife are incredibly special. But the people make this country tick. Explore each village by car instead of by plane. (William Njagi has been my driver since day one. He is the best, he is family, so call him: +254-722-318121.) Visit my friends in , the largest slum in sub-Saharan Africa, where more than 1.3 million people live without electricity. Meet the (M2) who use art to diffuse conflict. Pretend you're Anthony Bourdain and be a guest at someone's dinner table. Learn a special craft. Make a bead necklace with the mamas. Hunt with warriors. Use your network to access local people that can show you the real rhythm of life across Kenya. Stay at Olonana in the Maasai Mara and hang out with project director (and all-around top guide) . Visit the communities we work in. Book your travel to Kenya with . They know Africa beyond your flight and accommodations and they donate five percent of the cost to Under the Acacia's sustainable community development projects (just mention "Under the Acacia" when booking). 8. Be out of your element. 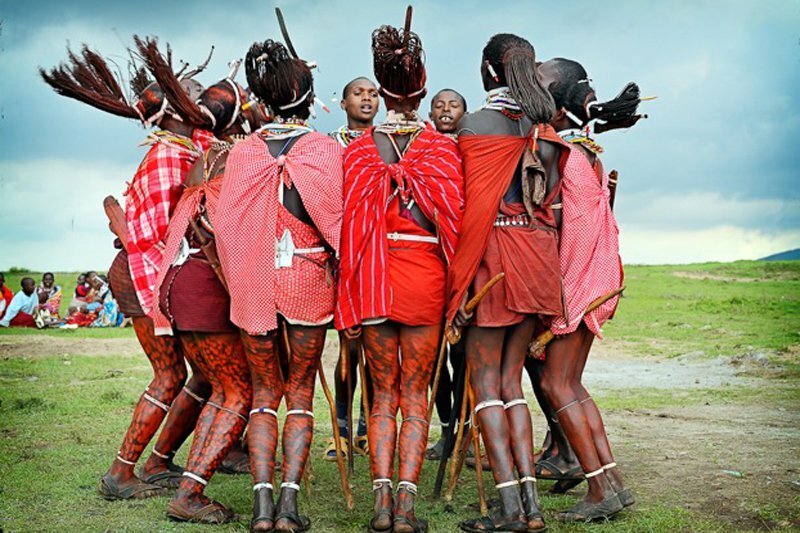 On my first trip to Kenya, I walked for days in the Ndoto Mountains with a group of Samburu warriors. To thank them for their hospitality, I bought them a goat. After slaughtering it, they insisted that I drink the fresh blood — from the neck. Every bone in my vegetarian body said no, but every tremor in my heart and mind knew I had to say yes, out of respect for this symbolic and spiritual moment. It was an honor, and I didn't want to miss the experience. Needless to say, I have been drinking blood for many years now in many remote villages as part of many Kenyan ceremonies. And, well, I'm back on cheeseburgers, too. Just saying. 9. Make new friends and expand your global community. Talk to your guides on safari instead of going for that hotel massage. Ask them about their culture, their home, their family. Go to the village that is not on the tourist itinerary. Kenyans are the friendliest people in the world. There are 42 tribes, each with a unique culture and lifestyle. During a visit to up in Northern Kenya, I spent time with the smallest tribe in Kenya, the tribe. There are roughly 1,000 of them left (only 100 in the area I visited). Their diet consists of fish from Lake Turkana. They don't speak English. They don't speak Swahili. They are awesome. 10. Indulge in sustainable empowerment. Handing out money to individuals doesn't really get at the root of charitable action. Do your research. Talk to people. Find an issue you care about. Visit organizations on the ground and see their work firsthand. Educate yourself and figure out a way to get involved in a sustainable initiative that makes a long-term impact. My actions were drastic: I quit my job two weeks after returning from a trip to Kenya to go off to the bush and start a non-profit organization. But you can start simply and immediately by investing in businesses and micro finance ideas, and investing in community development. Self-sustaining initiatives are key. I'm working on an exciting new project called Greystone Learning Center in Loita. We received a grant from the to implement solar-powered kiosks in the bush, with consulting by . We partnered with . We partnered with design genius , who is taking rural design in Africa to a whole other level by using thousands of bottle caps to make the building look like a piece of local Maasai jewelry. This is an income-generating activity for the community and 100 percent sustainable. Our partnership with on this game-changing initiative is a perfect example of the dream team. We're working with companies with a conscience and with experts who care. As the famous saying goes, when you fall in love with Africa you are, "bit by the Africa bug." Those who love Kenya really love Kenya. So what happens when you come back home? You put a few photos on your wall, display a few mementos around your house. Yes, of course. But what else? Make the world a smaller place and keep the conversations going. Build your African network. Depth is important. Revisiting and familiarizing yourself with a place gives you the best, deepest understanding of it. Was it just a vacation or was it a life-altering experience? Is it just a memory or is it part of your daily conscience? I dare you to come back from Kenya a different person. I dare you to get bitten. Find out more about Jessica's organization, . Jess is the founder of Under the Acacia, a 501(c)(3) that works in tandem with remote and nomadic communities in Kenya to generate sustainable initiatives that further community development and growth. Find out more about her at . She travels for a purpose.